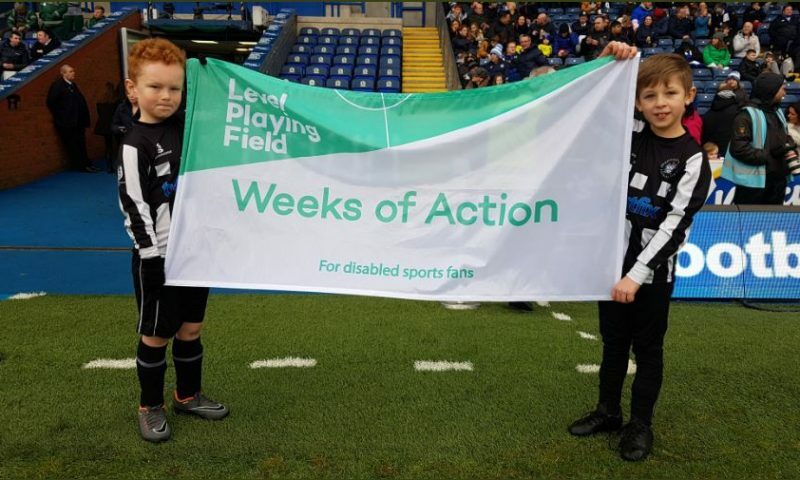 Blackburn Rovers kick off 2019 Weeks of Action. Blackburn Rovers have kicked off our Weeks of Action at their Inclusion day. This years Weeks of Action are off to a flying start. Blackburn Rovers celebrated their fantastic community work on January 26th at their home game against Hull City. Blackburn Rovers teamed up with the club’s Community Trust to champion a day of inclusion for everyone involved at the club. The day was celebrated with a continuous parade of diversity. The players were accompanied out to the pitch with a diverse group of members from the clubs supporter’s group. There was also a flag waving procession carried out by various participants involved with the community trust. Other events included, a raffle with some stellar prizes, Rover the Dog dressed up, match day programme piece and much more. The focus of the day was to show that Blackburn Rovers is a club for everyone. DLO Christine Rennard at the club has consistently reinforced this message. Under her lead the club will do everything to make disabled supporters feel welcome at Ewood Park. “From our perspective, Blackburn Rovers are a model example of how a club can work brilliantly with their fans and their Community Trust to make sure disabled people can enjoy live football. Blackburn Rovers are a huge club and throughout their recent challenges they have never compromised on wanting to support disabled supporters” said Development Officer Neal Hickey. We want everyone to get involved in this year’s Weeks of Action. We want you to celebrate what gets done for disabled supporters and how you enjoy and experience your match day. If you want to get involved in this years Weeks of Action, please get in touch with us on 01923 545 370.